Oily skin isn’t your fault. You’re born with it. But if you feel like the oil is taking over your life, you can fight back. It may seem crazy to moisturize when your skin doesn’t seem to need it, but it will actually help keep the greasiness under control. Oily skin is often accompanied by large pores and acne. That means you’re battling more than one problem. Fortunately, there are many high quality moisturizers for oily skin, and many of them shrink pores and prevent acne breakouts. When you’re shopping for the right moisturizer, avoid choosing ones with SD alcohol or denatured alcohol. Don’t buy a cream; select lightweight products without emollients. Emollients seal in hydration but they can clog pores and leave a greasy residue. Aim for lotions, liquids, and gels. Here are steps that beauty experts recommend for managing oily skin and reducing acne flare-ups. Use a water-soluble cleanser without alcohol and without fragrance. Exfoliate gently with a washcloth or soft brush. Wear sunscreen if you spend time outdoors. Select makeup products designed for oil control and consider using primer, too. Remember to cleanse and reapply moisturizer before bed. Blotting papers are great for soaking up the extra oil during the day without having to reapply makeup. We mentioned wearing sunscreen. Avoiding skin cancer and age spots are the obvious reasons for that. But sunscreen can also keep your skin from drying out from sun damage. Oddly enough, overly dry skin can cause an oil explosion on your face as it tried to compensate. Some people get away with applying toner without a moisturizer. If you have very oily skin, you could try that for a couple of days to see how it works for you. 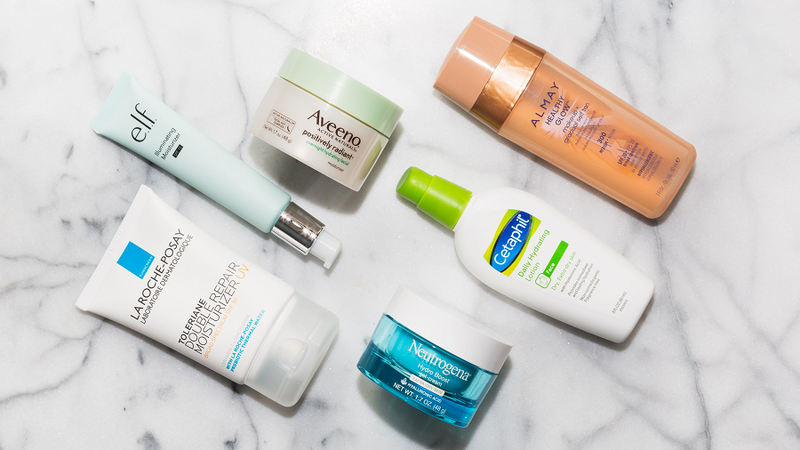 In the meantime, let’s take a look at the best moisturizers for taking great care of your oily skin. While almost every product we review in this article would work great for both men and women, we divided them into sections according to the typical market the manufacturer targets with their product. Mario Badescu brought European-style skin care to New York City in the 1960s. He soon had a loyal group of customers because his products and methods were that good. The Oil Control Moisturizer for Oily Skin soothes irritated, acne-inflamed skin with balsam peru, an extract from a South American tree. This ingredient is mildly antiseptic and helps heal skin. The lightweight, frangrance-free moisturizer hydrates skin without feeling greasy. Mario Badescu’s Oil Free Moisturizer plus SPF 17 has the same benefits as the product described above as well as sunscreen. It has no fragrance and protects against both UVA and UVB rays. La Roche-Posay is another company with ties to Europe. It began in France when the La Roche-Posay Thermal Center opened. The hot springs there were used to treat a wide variety of skin disorders. Eventually the company moved into manufacturing skin care products, too. Their Effaclar Mat Oil-Free Facial Moisturizer has won multiple awards for its effective formula. It manages to shrink the appearance of pores, control excess oil, and hydrate skin all at once. It leaves skin with a velvety-soft matte finish that’s perfect for use underneath makeup. If you read the list of ingredients, you’ll see it contains one of our no-nos to avoid: denatured alcohol. But many customers swear by this product, saying that it works great on their sensitive skin. We’re still reaping the benefits of French skin care technology in this product, the Eau Thermale Avène Mat Emulsion. It contains water from natural hot springs combined with zinc gluconate and monolaurin. The zinc reduces redness and irritation while monolaurin slows down oil production. Avène’s formula does not contain parabens or ingredients that clog pores. Some users have been thrilled with their results using the Mat Emulsion. They say they see a noticeable reduction in their pores and blackheads and fewer acne breakouts. Vichy is one of those companies whose products you’ll see on the shelves of high-end European pharmacies. These aren’t sold in the continent’s equivalent of Walmart or Target. The Normaderm Beautifying Anti-Acne Moisturizer for Oily Skin contains 1.5% salicylic acid. This may cause an allergic reaction if you have an allergy to aspirin. But it’s the perfect ingredient for gently clearing up acne and exfoliating dead skin. The addition of glycerin means your skin will soak up hydration and feel softer. Plus, the 15 essential minerals from water derived from French volcanoes gives your skin a healthy dose of goodness. You can apply the moisturizer up to three times a day, although it stays effective for up to 24 hours, but do avoid putting it around your eyes. While it does not contain parabens, it does have denatured alcohol. Yes, today we are all over France. The trend continues with L’Oreal Paris’ Hydra Genius Daily Liquid Care for Normal/Oily Skin. One application can last up to 72 hours—but that doesn’t mean you can’t use it every day. The formula contains aloe and hyaluronic acid for a blast of nutrients and hydration. Customers love its soothing effect on their skin, plus its price is considerably lower than some of the high end moisturizers we’ve covered up to this point. Oil of Olay’s Hydrating Gel is on the recommended list of some of the most trusted beauty sites and magazines. It’s super lightweight and cool on skin. The essence of honeysuckle and white tea soothes skin and shrinks pores. The gel actually includes a powder that helps control oil and brighten skin (but this is not a makeup powder that changes skin tone). On the good side, lots of users are very pleased with this gel. Other helpful ingredients include niacinamide, glycerin, panthenol, and Vitamin E (tocopheryl acetate). On the down side, there are parabens in the formula. Parabens are still considered safe for use in cosmetics, but some customers prefer to avoid them wherever possible. Yes, guys, you need to take care of your skin, too. Make your face moisturizer part of your after shave routine to keep acne at bay and eliminate razor burn. Baxter of California’s Oil-Free Moisturizer gets rid of shine from oily skin. Its formula helps your face heal faster from breakouts and other irritations. You may have had this lotion on your face after a hot towel shave at the barber’s. Although it contains aloe vera, chamomile, and green tea extracts, it’s fragrance-free. A small amount goes a long way, and it absorbs quickly into skin. Here’s what Anthony says about their Oil Free Facial Lotion: “Your skin shouldn’t outshine your personality.” There’s a little humor for you today, anyway. But their product is no joke. They recommend using it morning and night after you’ve washed and toned your skin. The lightweight formula contains aloe, chamomile, sodium PCA amina acids, and glycerin to sooth and soften skin plus add hydration that lasts for hours. Jack Black’s Double-Duty Face Moisturizer provides hydration while it protects your skin from sun damage. It blocks both UVA and UVB rays with SPF 20—that’s enough protection to let most people tan without burning. The ingredient list contains Vitamin E from blue algae, Vitamins A and C from sea parsley, a plant that heals irritated skin too. The formula also has edelweiss and platago, antioxidants that speed up collagen synthesis. More collagen means fewer fine lines and younger-looking skin. Like all of Jack Black’s products, this one is vegan, and free of parabens, gluten, and fragrances. Any of the moisturizers reviewed above could be used by men or women, just like the two unisex ones described below. In fact, some women may prefer the men’s fragrance-free formulas over some of the scented products aimed at female demographics. Listed below are two very popular top sellers that are gentle on sensitive skin, and effective at hydrating faces without feeling greasy. Cetaphil is a brand frequently recommended by dermatologists. The Dermacontrol Moisturizer won at least five awards since it launched in 2012. You can use it while you’re taking prescription acne medications. In fact, it’s smart to do that because acne meds usually dry out skin. Dermacontrol absorbs oil and calms irritated skin. Users report that it does a great job of reducing oil while it makes their skin feel softer. It has a light texture, but it does take a little while to absorb into the skin. If you use it underneath makeup, let it dry for five minutes first. It has no fragrance and contains no parabens. Glycerin is one of its main ingredients, and that’s a very safe humectant for sensitive skin. Dermacontrol is also recommended by the Skin Cancer Foundation as a sunscreen with SPF 30 protection against both UVA and UVB rays. The Neutrogena Oil-Free Moisture for Sensitive Skin has no oils, fragrances, alcohol, or dyes. It’s perfect for people with a mixture of dry and oily skin. It can be applied both day and night, and both men and women have reported success with it. It goes on thin and smooth, and absorbs quickly so there’s no greasy feeling. Just one squirt from the pump top bottle goes a long way. A good moisturizer isn’t your only defense against oil. Instead of taking time to wash your face and reapply everything, or caking on powder to try to absorb excess, have you tried using blotting papers? The Natural Bamboo Charcoal Oil Absorbing Tissues gently soak up extra greasiness. They have no active chemicals in them. Using these is a great way to tone down the shine without having to replace all your makeup. If you prefer a name brand oil-absorbing sheet, try these from Clean & Clear. We went over steps for managing oily skin up at the beginning of this article. Here are a few more tricks that can help. Use face cleansers with glycolic and salicylic acids. Use toner to shrink your pores after cleansing. Prime, prime, prime—eyelids are a greasy place, so use eye primer instead of concealer on your lids. A setting spray can help makeup stick even better. Use powder as your foundation instead of a liquid, but don’t overdo it. Consider using a serum instead of a cream at night. Pamper your skin with a once-a-week face mask that contains kaolin or bentonite clay. If you’re not one to wear much makeup, or if you’re a guy who doesn’t wear any at all, you can manage oily skin with a lot of the same tips. Invest in and use a good quality cleanser, use a toner, and moisturize. If you take care of your skin, your pores won’t feel the need to overdo oil production. We hope we helped you find the perfect products today to help you take good care of your oily skin. It’s not your fault that you have it, but you have the power to manage it. You can cut down on acne breakouts and makeup meltdowns with just a few minutes of TLC each day. Come back soon to see reviews of the best in personal care products.